When firefighters die in the line of duty, the entire fire service and Country grieves. We look for ways to make sure their lives and their sacrifices are honored. We also want to ensure that the families, departments and friends of the fallen find comfort and resources they need to rebuild their lives. 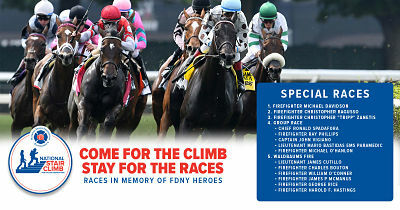 Join hundreds of FDNY firefighters as well as firefighters from around the Country to honor America’s fallen heroes. Gates open and on-site registration begins at 9:00 am. Participants will climb the equivalent of 110 stories to symbolize the number of floors in the Twin Towers. All climbers will receive a commemorative event shirt and a name badge for the firefighter they are honoring. The stair climb is a "Family Day" which means the Park will have bounce castles, pony rides and other fun family activities. In addition, the New York Racing Association will raffle two (2) 2018 Belmont Stakes Day reserved seats valued at $200 each.